Seven-year-old Julia Warren and her grandmother, Leigh Ann, came to Maryland from Tennessee after Julia was diagnosed with a very rare cancerous tumor. But aside from the bald head and scar on her arm, you would never know that this energetic, bright-eyed, giggly little girl was fighting the battle of her life. In March 2013, Leigh Ann grew concerned about a lump underneath the skin of Julia’s left arm. Through a series of meetings with doctors, surgeons, and more doctors, they found out that Julia had a very rare cancerous tumor in the nerves, muscles and possibly the bone in her arm. The hospital’s treatment included intense radiation, and if that didn’t work, complete amputation. Julia loves the color pink. She loves being a princess. She loves coloring, especially with new friends. And she loves to hug and squeeze her dog, Duke. Life would be drastically different with just one arm. 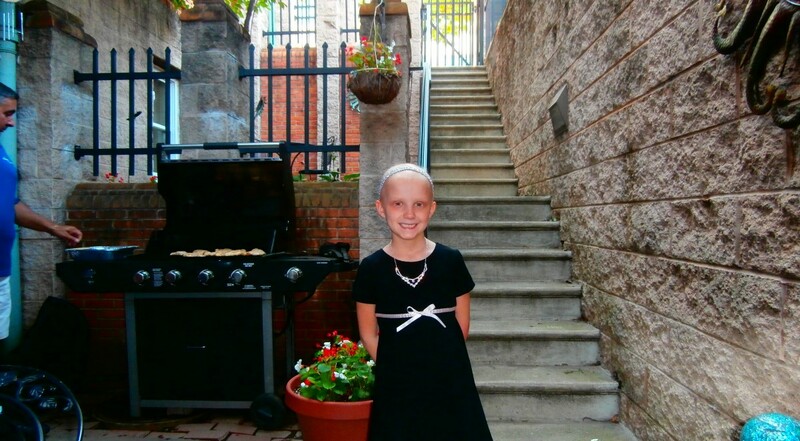 Leigh Ann researched other options and stumbled across a doctor at Johns Hopkins Children’s Center in Baltimore, MD, who specializes in removing tumors like Julia’s. They immediately booked a flight to see him, without any idea where they would stay. “We would not be able to be here for her treatment without you guys,” said Leigh Ann. Just hours after they stepped off the plane, they moved into the Believe In Tomorrow Children’s House, where they have made a home away from home for the past five months. Julia warms the hearts of everyone she meets. She “supervises” staff projects, helps volunteer groups prepare family suppers, attended several Believe In Tomorrow events as a special guest, always with a giggly laugh, a smile on her face, and a bow on her head. Julia barely seems to notice the scar she sports from a recent surgery to remove the tumor, though parts of it still remain in her arm. She will still have to go through chemotherapy, radiation, and at least one more surgery before returning to her home – and her dog – in Tennessee. But in the meantime, she still has dozens more friends to make and more hearts to touch while she and her grandmother stay at their new home at the Believe In Tomorrow Children’s House at Johns Hopkins!